Black Desert Online is a sandbox, living-world MMORPG. It features combo-oriented, non-targeted combat and massive FFA guild battles. You can pick up a 30 Day Pass Key on Alienware Arena all you have to do is create or login in to your Alienware Arena account. 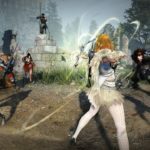 Steam and Pearl Abyss are offering a free-to-play weekend for the very popular Black Desert Online! Click the red button and play the game for free until Monday, January 29! Additionally, you can get the game at a 50% discount!